Umer was working in a project where chaos was the approach the teams were taking. Not a good way to start, especially not for a new Scrum Master. This led Umer to learn a few tough, but critical lessons about how important it is to set expectations and priorities correctly. 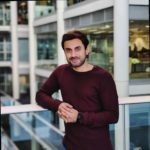 Umer is a Scrum Master, joining us from London, UK, currently working for one of the largest TV broadcasters in the UK, ITV. He has 5 years experience working in Agile environments spanning across Sports, Broadcasting, Travel and Publishing. You can link with Umer Saeed on LinkedIn and connect with Umer Saeed on Twitter.